January birding over 3 weekends at Rainham Marshes RSPB produced typical winter visitors including a nice build up of duck in their winter finery, nervous Lapwing flocks hosting a few Golden Plovers and a lone Ruff, and fly off at any moment Rock and Water Pipits which did just that along the Thames shore. A Brent Goose flew off the reserve heading towards the Dartford crossing mid month. Marsh Harriers showed very well throughout my visits and that rarity of the month, fine calm and sunny weather, saw the Harriers become more airborne on one visit. A couple of Peregrines, one a feisty juvenile that had yet to hone its hunting skills and the other, an adult staring menacingly at the occupants of the Target Pools from its pylon perch on the 3rd weekend visit. Of the waders the wintering Avocet flock continued to enjoy Aveley Bay and scattered groups of Black-tailed Godwits chatted away to each other when feeding on the exposed mud. Back over the river wall cryptic plumaged Common Snipe showed in big numbers along the edges of Purfleet Scrape but prolonged scans did not reveal any by the name of 'Jack', still time to connect with them here this winter. It's winter 'gulling' season and from past experiences back home in Yorkshire an increase in Great Black-backed Gull numbers mid winter usually leads to sightings of the 'white winged gulls'. Particularly around mid January there was a noticeable increase in GBBs along this section of the Thames shore, compared with back in December. I came across a candidate white-winger that was hiding amongst its commoner gull friends on Wennington Marsh (19th). 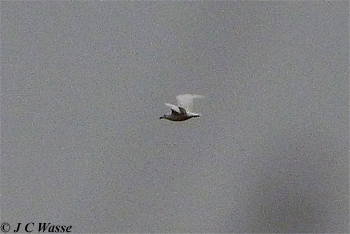 From first look surely it was an immature Iceland Gull, very white with small head and a fair primary projection. A closer study with the help of a few of the local birders soon suggested otherwise. The pure black bill, the extensive white upperparts without obvious flecking, still early in the 'gulling' season for it to be so white for what was perhaps a '1st winter' bird (dark eye). Also, was the obvious primary projection so obvious? Local knowledge was that a leucistic Herring Gull had been spotted and photographed a day or so ago in the area and the thinking was that this was the same bird. Nevertheless, an educating 'Larid', grainy record photo below of it in flight when it looked chunky. A shame it didn't stick around for a longer study. Waxwings are annual winter visitors in varying numbers to these shores, their smart crested appearance gives them a look like no other species found in GB, and they prove to be of interest to birders and non-birders alike. Whilst birders await an irruption year, this is not such a year, but any sighting is always nice. One in central London just east of Euston station was hanging around a single Rowan tree whose berries were coveted by Blackbirds and wandering Redwings alike. Connected first thing one morning a couple days or so before the tree was stripped of its fruit. 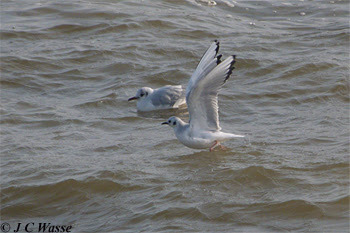 Bonaparte's Gull, on appearance could be described as the North American equivalent of our familiar Black-headed Gull. A scarce to rare visitor to the UK with new birds usually found in Spring with a bias to the west / south west. Several (east) sightings along the Thames over the last few years probably refer to a returning bird which then settles in at Oare Marshes in Kent during summer. News broke (20th Jan) of an adult winter found across the Thames from the Rainham Marshes area (directly opposite Coldharbour Point). Another fantastic spot by some of the capital's dedicated gull watchers. At the time I was across the river at Rainham Marshes RSPB having completed a WeBS count along the shore from near the Stone Barges to the RSPB centre. 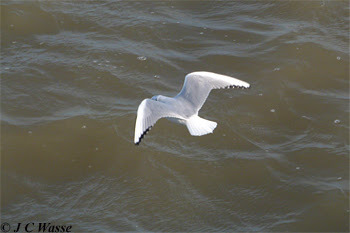 Soon back up river to Coldharbour Point but the sunlight and distance counted against me as the 100s if not into the 1000s of Black-headed Gulls flew around Erith Pier. No chance of spotting in such conditions. The Bonaparte's Gull was seen throughout the following week so I was off to Erith the following Saturday (26th) from dawn to late afternoon. The fact that the gull apparently favoured high tides and such tides were in the hours of darkness that weekend, this resulted in a no show all day to all comers. Literally 1000s of Black-headed Gulls were seen and a 2nd winter Yellow-legged Gull was present in the morning. 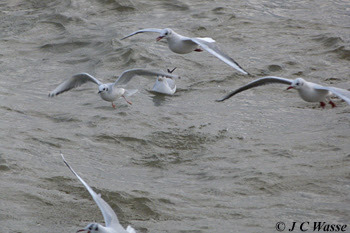 An adult Mediterranean Gull sporting a partial black hood joined a flotilla of Black-headed Gulls as the tide finally began to rise late afternoon. Highlight was the Morrisons all day breakfast that showed very well but briefly just inland of the pier late morning. I thought that was that, but then the Bonaparte's Gull was seen at around high tide the following Thursday, I believe this was the first sighting of the week. No news on the Friday after overnight snow continuing as a wintry mix in and around London the following morning, would the bird have moved on? Nevertheless, I was back at Erith Saturday morning (2nd Feb), this time the Morrisons breakfast showed well around 0900. Soon back on the pier in a biting cold northerly wind, but at least it was dry and part sunny. 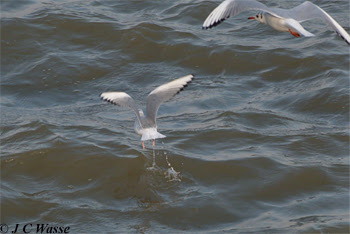 The first sortie of about 20 Black-headed Gulls came in and a quick check of the bills went something like, "red, red, red, red, red, black, red, red." 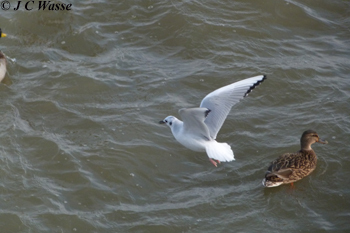 Hang on a minute back onto the 'black-billed' gull, its pink legs stood out as did the white underwing at the 'hand'. It was in! 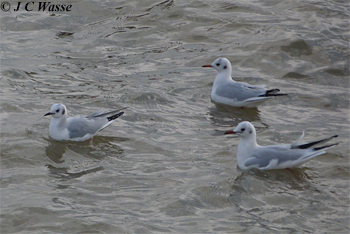 Quickly noted the other features including the grey neck markings, the size and shape of the bill and the overall 3/4 size build of a Black-headed Gull when it was swimming on the Thames alongside it's commoner friends. It was bitingly cold and it took an age to tweet out the sighting. The bird continued to show well for the next hour then became a little bit more elusive up to leaving at 1200. It looked like all visiting birders caught up with this Nearctic visitor in the morning. 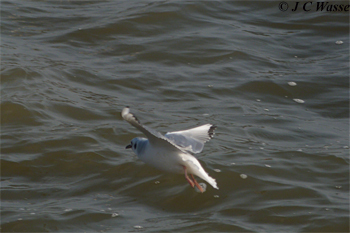 I took a lot of photos and videos of the Bonaparte's Gull and also spent time studying it, especially in flight... the gull not me! 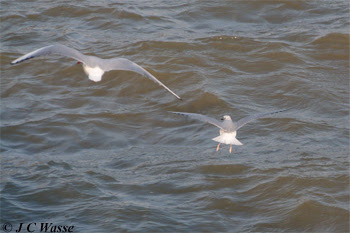 At most angles it was difficult to pick out in flight at such close quarters amongst the Black-headed Gulls, but on occasion it would stop in flight and drop to the surface like a Little Gull or Tern, sometimes dropping its feet and looking like a Petrel. At other times it looked smaller in flight but then was soon lost in the melee of the comparator Black-headed Gulls. When swimming on water it's diminutive size was clearly visible. 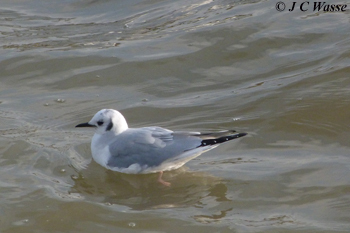 A distinct feature of this bird was a slightly protruding central tail feather, a wannabe Ross's Gull. If this was the same bird I saw a few miles up river at Crossness back on 06 July 2013, the weather conditions were now so different, as in July 2013 it was an unbearable 30C, a sharp contrast to the finger numbing -2C windchill greeting gull watchers on Saturday 2nd February 2019. A selection of photos below, more at the 'Latest UK Bird Photos' page. Please enjoy.